This is an update on Norway’s high-level cooperation to launch the world’s first electric and self-sailing cargo ship, the Yara Birkeland. Fertiliser firm Yara had turned to shipbuilder Vard last year and they have been making progress ever since. The Yara Birkeland has been called the Tesla of the Seas when plans first emerged on the 25 – 30 million euro project. It was not the investment however, but the ship’s electric and autonomous nature that inspired the Tesla reference. While still under development, the Yara Birkeland is slated for launch in early 2020. The electric cargo ship will take up service straight away, sailing fertiliser 60 kilometres down a fjord from a production facility to the port of Larvik, Norway. The vessel’s self-sailing capability is guided by GPS, radar, cameras and sensors, so that the electric ship can navigate itself around other boat traffic and also dock on its own. The technology has been developed by Kongsberg of Norway, which builds guidance systems for civilian and military uses. At the beginning the runs will be monitored first on board and then remotely from the shore before the Yara Birkeland will sail all by itself from 2022. This also justifies the price of construction. 25 million euros is about thrice as much as vessels of its type usually cost. However, once the operation is fully autonomous, no cost for crew will incur. In addition, the project has received NOK 133.6 million in support from the Norwegian government enterprise ENOVA. Yara is thinking to expand such services, so that fertiliser may be shipped on unmanned electric ships as far as Brazil. The International Maritime Organisation (IMO) does not expect legislation for such ghost shipping operations to be in place before 2020 though. With a length of 80 meters and a beam of 15 meters, the vessel will have a cargo capacity of 120 TEU (twenty-foot equivalent unit). 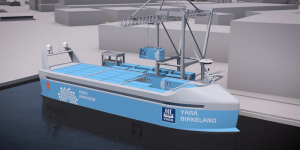 Yara estimates the electric ship will replace 40,000 truck journeys a year.